Even by Kafka’s standards In the penal settlement (to use the 1949 translation by Eithne Wilkins and Ernst Kaiser) is a singularly depressing and pessimistic story. An explorer visits a condemned man before his execution, and is told by the officer in charge that the man is to die by a slow and protracted form of torture, death by a sort of hybrid between tattooing and acupuncture. The officer is distressed that this method of execution is to be discontinued and – to cut a fairly short story rather shorter – substitutes himself for the victim in the hope of achieving the enlightenment he has previously observed in his victims’ eyes. However a malfunction in the machinery kills him before this catharsis can take place, and the explorer leaves apparently little the wiser for his encounter. The translation used by Glass’s librettist Rudolph Wurlitzer is In the penal colony and he changes the name of the ‘Explorer’ to the ‘Visitor’ which is no better a translation of Kafka’s original Forschungsreisende but perhaps points up the modern applicability of the story more precisely. 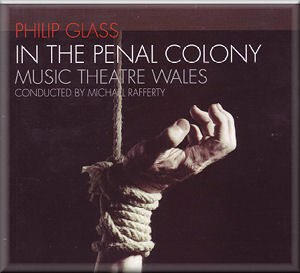 The work was first performed in Seattle in 2000, and so predates the Guantanamo situation; but this recording is based on the UK première in 2010 where the production photographs included in the booklet seem to indicate that the parallels with Guantanamo were clearly evoked – not that anything that happened at Guantanamo was as horrific as the situation Kafka presents. Incidentally Wurlitzer cuts the repulsive scene in Kafka when the condemned man vomits into his gag, for which mercy much thanks. The trouble with Kafka’s original story is that the reader can feel no sympathy whatsoever with either of the two principal characters: either the hidebound officer who is so in love with past tradition that he is willing to suffer torture rather than give it up, or the ineffectual visitor who despite his personal misgivings is incapable of taking any public moral stance whatsoever. The booklet notes give no indication at all why Glass thought that this thoroughly pessimistic story would make good operatic material, although he has been a past master at making music-drama out of the most unlikely of scenarios. This story is not about a mythical archetype like Gandhi or Akhenaten; these are real people, even if their actions are not readily comprehensible. In Beauty and the Beast Glass had the characterisation of the original film to provide a scaffold for his music; here he has to provide it himself from scratch - it seems impossible somehow to avoid gruesome gallows humour. Because the accompanying ensemble is so small (only a string quintet) it should in theory be clearly possible to hear every word that is sung. The problem is that it is not: either because the word-setting is difficult to sing – which in fact it does not appear to be – or because the singers are unable to vocalise with clarity on the notes they are given, or because solo strings provide more competition for the singing voice than a string orchestra would do. Paradoxically enough it is easier for violins to play softly en masse than when there are fewer of them. Although both the singers are technically proficient, neither have the chance to project with sufficient force – which is needed at times. Fortunately the booklet provides complete texts and stage directions, so it possible to follow the plot with the aid of these and the production photographs. As the music proceeds, Glass’s music begins to take hold. After a lengthy introductory scene we reach the point where the ‘visitor’ moves to the front of the stage and delivers a brief soliloquy. The music suddenly hesitates, becomes unsure of itself; and the dramatic situation grips for a while before the cycle of repetitive ostinati begins again. It slowly becomes apparent that the small size of the accompanying ensemble is a real problem. Moments which demand a more positive response from the orchestra just don’t get it. The sound of the torture machine when it starts up adds a percussive accompaniment which introduces a new sound, but it doesn’t have the emotional impact that the situation really needs. It might grab one in a live performance, but as a purely musical experience it lacks immediacy. And the description by the officer of executions in former days brings a horrific parallel to the torture scene in James MacMillan’s Ines de Castro - written four years earlier - with even the music initially sounding very much the same. Just a coincidence? Whatever the reason, one feels distinctly uncomfortable with the jaunty upbeat music with which these scenes are described; in the case of the MacMillan it is a positive frisson of disgust, but here it is just queasiness. And so the dialogue goes on, for what seems an eternity; because neither the duologue itself nor the emotional situation manage to really seize the listener’s imagination. The scene culminating in the execution of the officer brings a sudden increase in the musical pulse, with an access of some sudden dramatic engagement from the singers; but this soon passes and the final scene for the ineffectual visitor returns us to the slower music from before. This does has a greater intensity, of an emotional catharsis achieved; but it is all a bit late, and the ending is far too abrupt with no time allowed for consideration of the allegory to sink in. The singing, as I have observed, is technically fine; but neither of the singers ever manage to achieve really full voice in the parlando delivery they are consistently asked to adopt. Ebrahim has a long and distinguished track record in modern music, but Bennett’s very English voice lacks a real tenor ring. One notes that his experience in ‘traditional classical’ music seems to have been limited to Monteverdi and Mozart, but his character does not seem to demand any real heroics. Ebrahim similarly does not raise his voice even when the libretto specifies that “he yells down to the Visitor” or “he yells to the condemned man”. His somewhat monochrome delivery of Glass’s musical lines does nothing to bring life to the increasingly horrific situation. The players of the Music Theatre Wales Ensemble deliver the notes precisely and with life, even when they understandably sound rather weary on occasion. They are physically unable to summon up any additional strength for the climax at the end, when it really is needed. There have been a number of operas written since the war which address either directly or indirectly the issues addressed by Kafka’s short story. The most effective is surely Dallapiccola’s Prigioniero, which is far more subtle in the way it addresses the issues of ‘crime’ and ‘punishment’. It’s also far more sinister in the way that it identifies the most effective torture as being the illusory hope of escape. Glass’s opera, for all its good intentions, is not in that class. It is simply not unpleasant music, and the story surely demands that it should be.